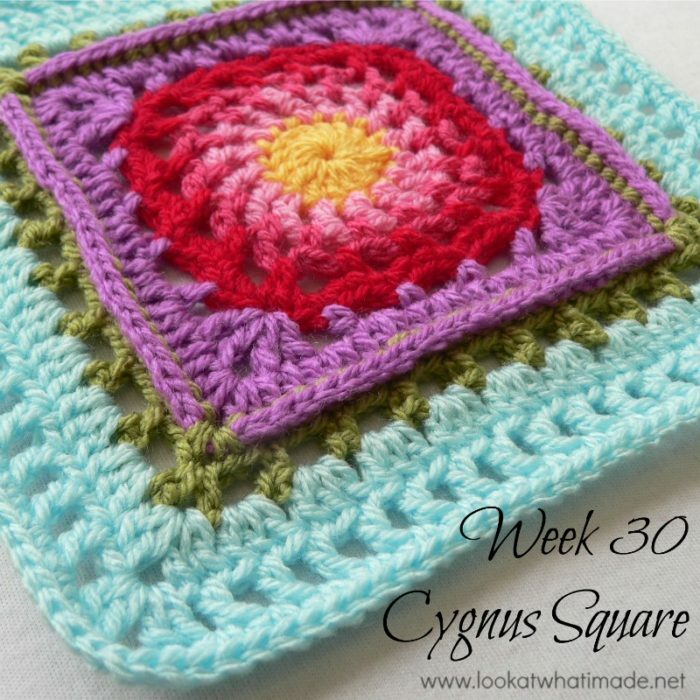 Block 30 of the Block a Week CAL (hosted by Kimberly Slifer) is Chris Simon’s Cygnus Square. We have featured a few of Chris’ designs and I love each and every one of them! 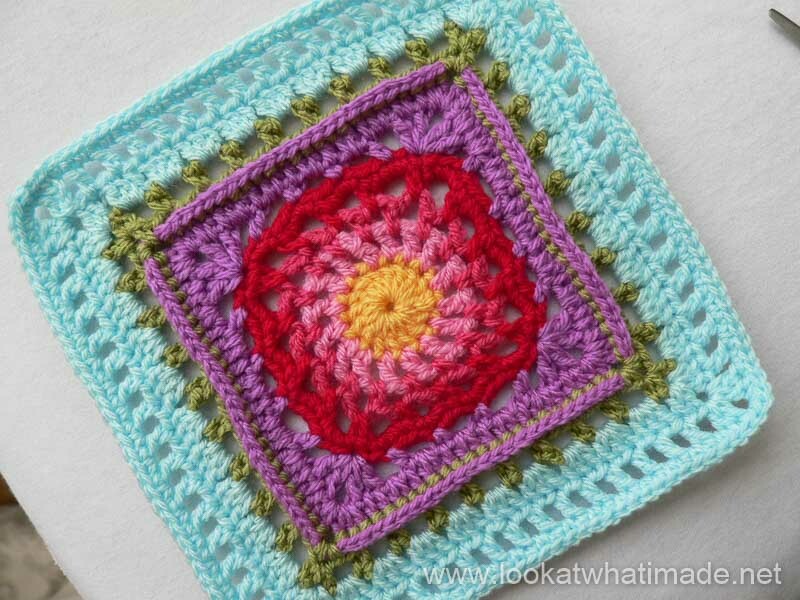 In fact, I love them so much that I approached Chris about using the center for her Lace Petals square in a Mandala I was designing. Luckily for me, Chris agreed to let me use her center. 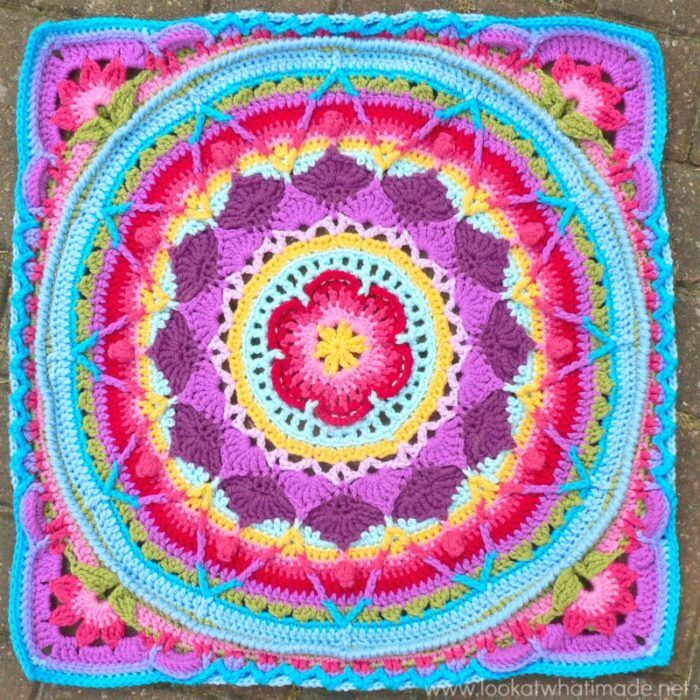 Update: You can now find this pattern (Sophie’s Garden) as Parts 1 – 4 of Sophie’s Universe. This week the training wheels are coming off! 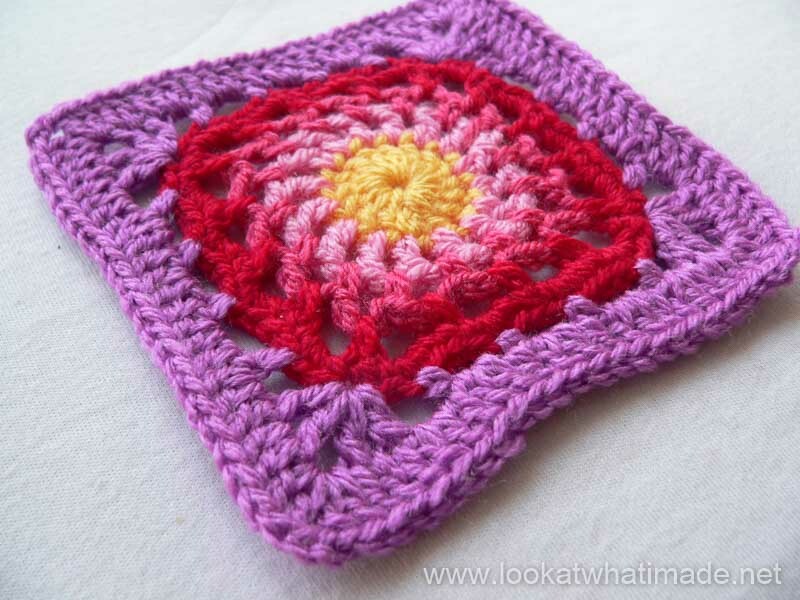 This square is so easy that I didn’t do step-by-step photos. I did do a step-by-stepper for Round 6, but it really wasn’t necessary. 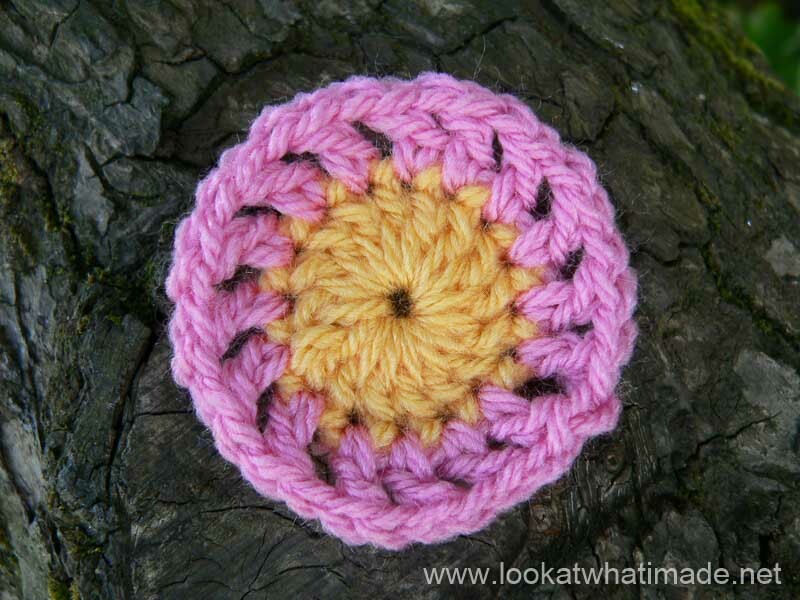 I have included stitch counts for each round, because they weren’t included for each round in the pattern. I have also included a photo of each round. 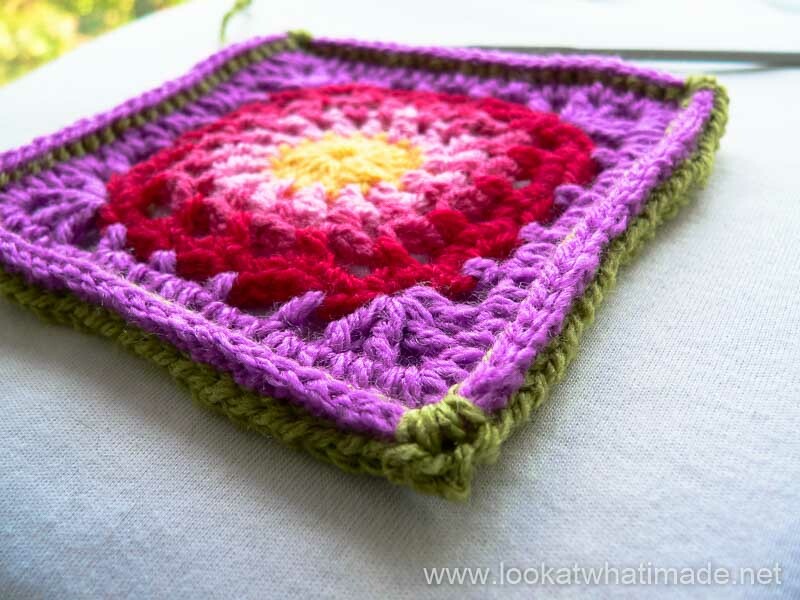 Using a 4 mm crochet hook (US G/6 UK 8) and double knit yarn, as I have done, your finished square will be about 7″ big. It is one of the tinier ones. 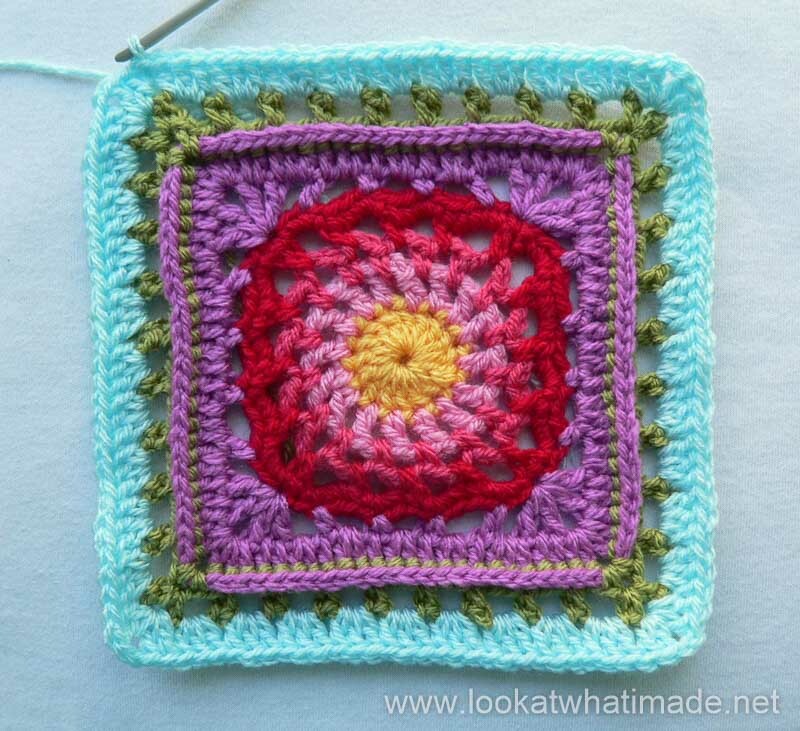 Thank you very much to Chris Simon for giving us permission to do this photo-tutorial for her Cygnus Square. And a special thank you to Kimberly Slifer for letting me do these tutorials and for obtaining the necessary permission. Into a magic ring: ch 3 (counts as your first dc) and make 15 dc’s. Join to the top of the beginning ch-3 with a sl st. If you are using the same colour, ch 4 (counts as your first dc and ch 1). (Dc, ch 2, V-st) in the same stitch. This counts as your first corner. 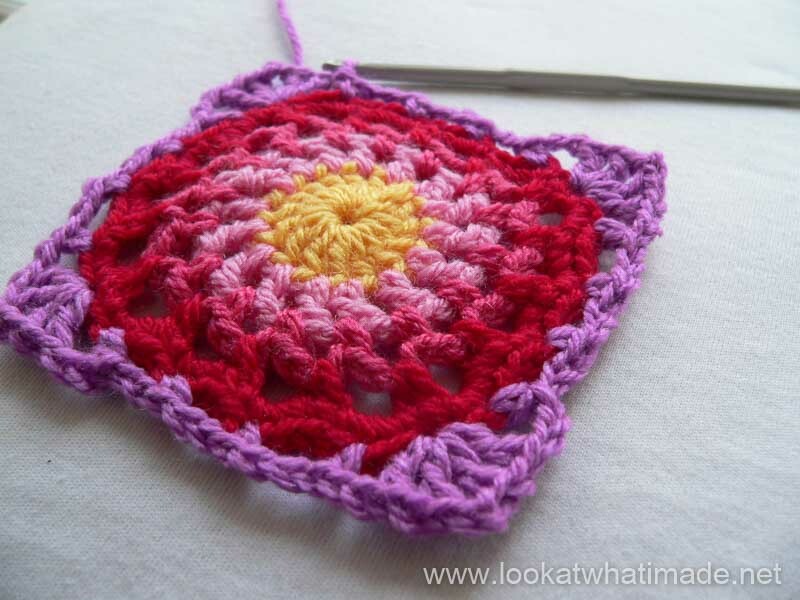 If you are using a new colour, join with a standing double crochet in the same stitch as the sl st join. Ch 1. (Dc, ch 2, V-st) in the same space. This counts as your first corner (Photo 1). Repeat from * to * 3 times, omitting the last corner on the last repeat. 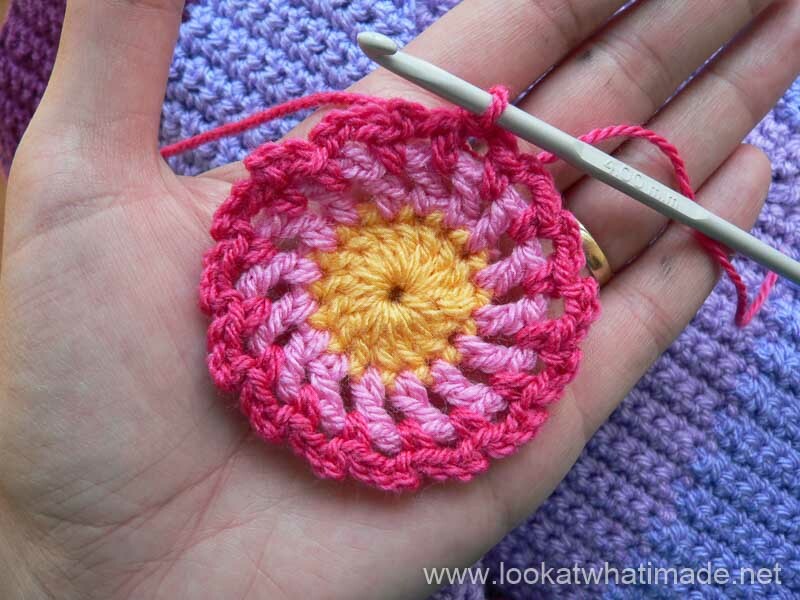 Join to the third ch of the beginning ch-4 (or the top of the standing double crochet) with a sl st.
As written. 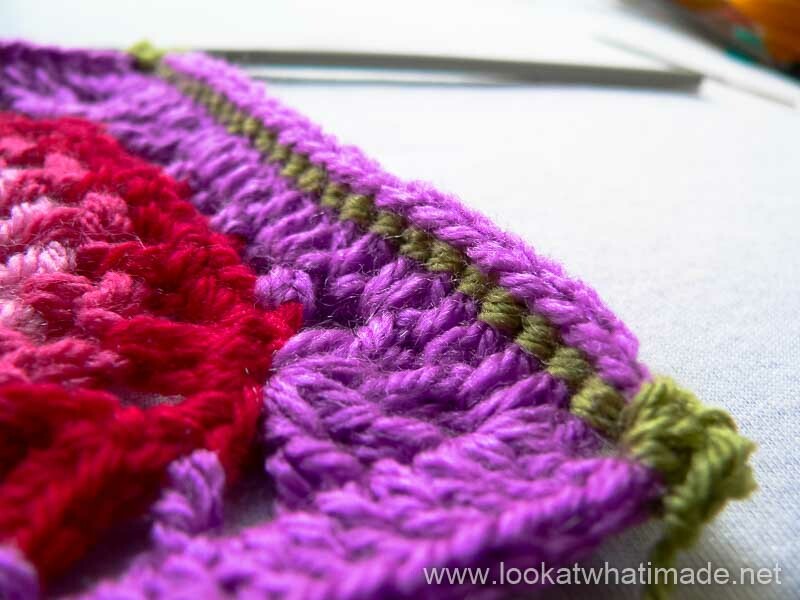 Remember that the top loops of the first dc after every corner will be slightly hidden by the stitches of the corner. Don’t accidentally skip it. See this tutorial if you need some visual help. It is also a bit tricky to get into the loops of the hdc’s after the ch-2 spaces. Hdc’s are always tricky to get into if they follow chain stitches. 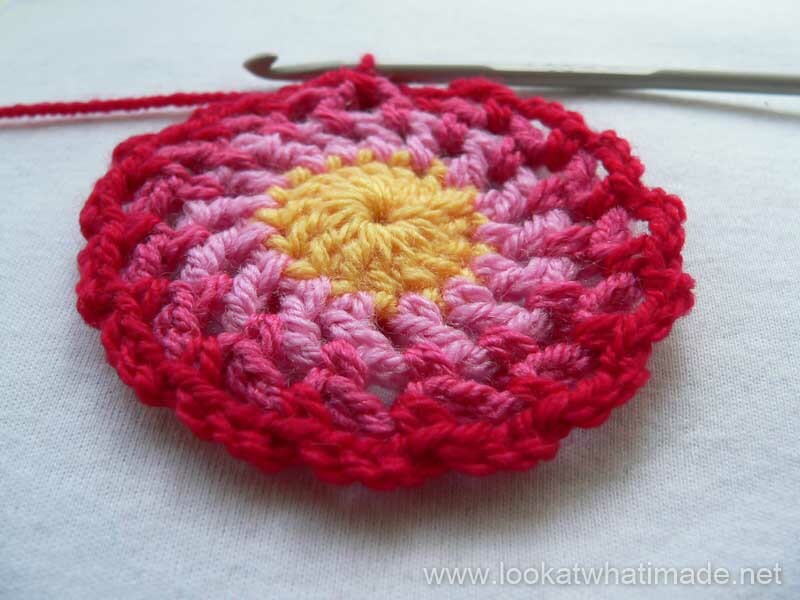 If you really can’t get your hook into the loops of the hdc, just make the stitch into the ch-2 space before the hdc. It’s not the end of the world! My Round 7 looks a bit wonky, but that’s just because I didn’t straighten it up before taking the photo. Whoopsy! Right…my apologies, girls. It seems that my brain went on holiday in this round. 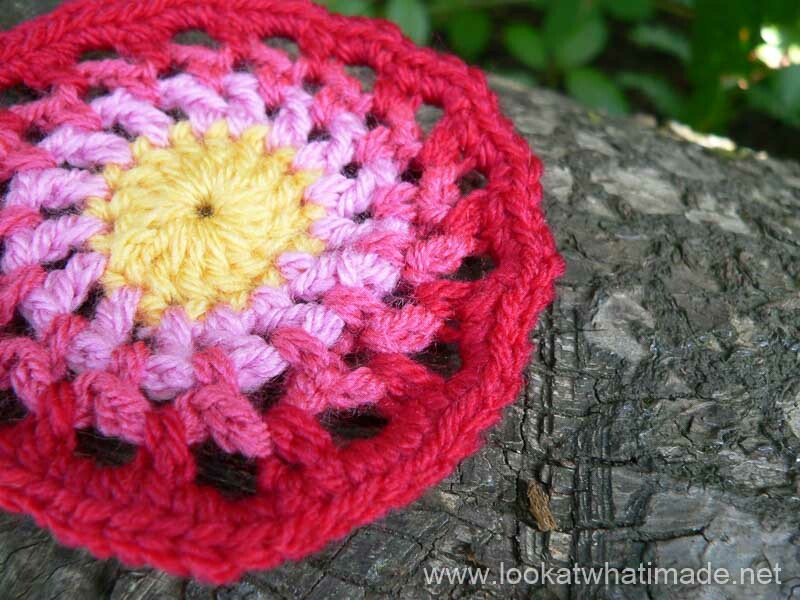 The round is written as BLO (back loop only), but I read (and crocheted) it as Back post instead. Thank you to Viv Voster for pointing that out. 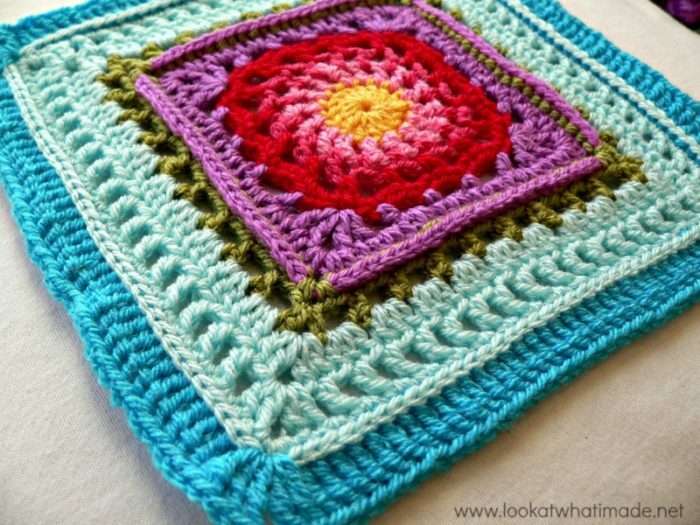 … but aren’t the raised stitches pretty regardless? 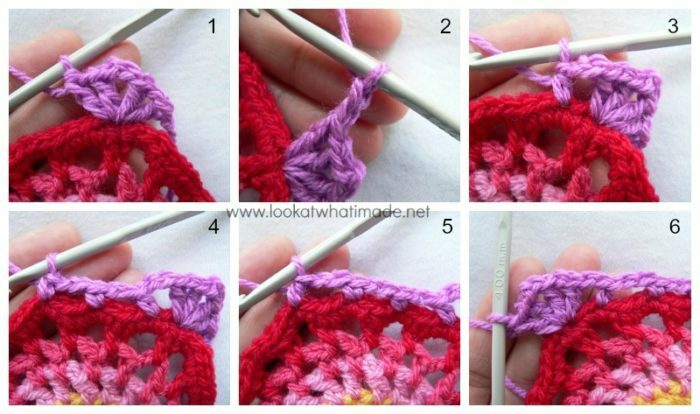 Remember to count that first hidden stitch after the step when skipping the first 2 sc’s on each side! 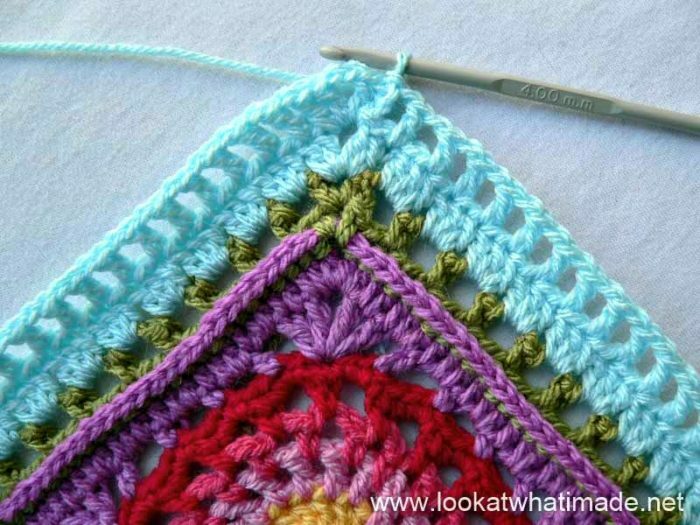 Remember that the very first stitch you skip on each side will be the hidden stitch. 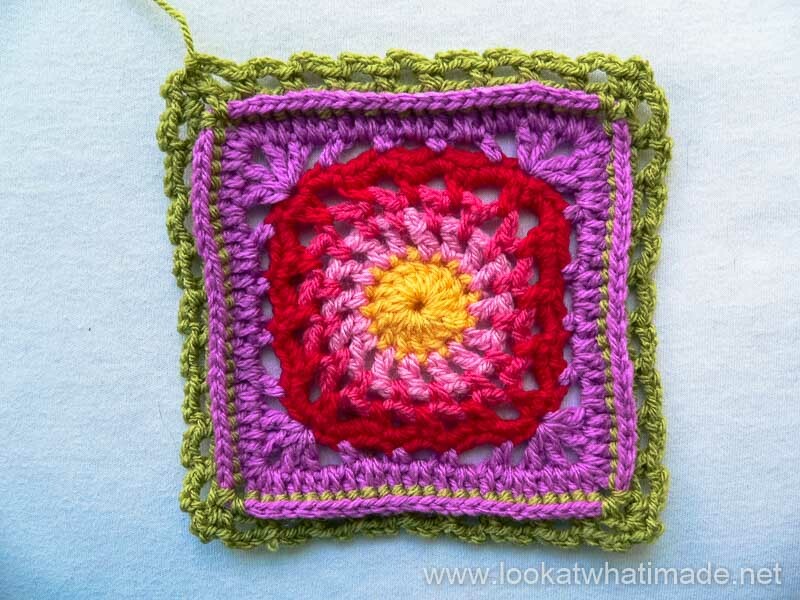 I have added an optional Round 13 to my square to get it to the same size (and stitch count) as the largest of the squares. You can find the instructions for that here. I’m confused over round 8. 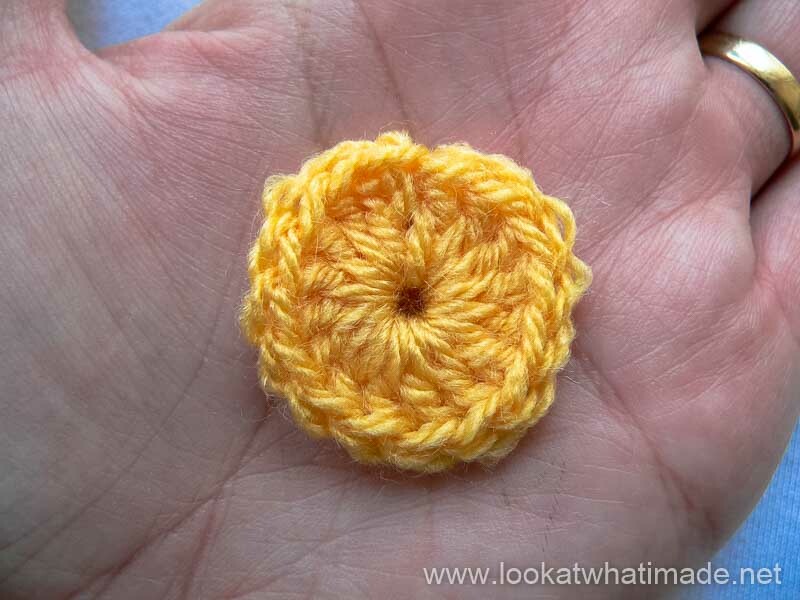 Chris says to crochet in BLO but you’ve done a BPSC I think.